Words are powerful; take them seriously. Words can be your salvation.^Words can also be your damnation. Matthew 12:37 The Message. ^When a large, majestic ship travels across the ocean, its progress is controlled^by a very small rudder. Our tongues are like the rudder of the ship. The tongue^controls what we say. 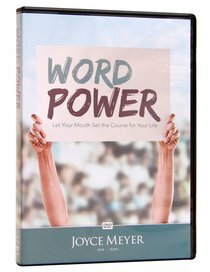 And what we say greatly influences the course of our lives.^This DVD from Joyce will challenge you to pay more attention to the way you speak. God is the One who gave us the precious gift of speech. With His help, our words can become powerful tools to bless, heal and encourage others.